Brand New! The Beast Power Weightlifting Hooks by GymPaws. - Lifting hooks are used ONLY for pulling exercises like Deadlifts, Shrugs, Lat Pull Downs and even Pull Ups. - Generally they are used for heavy lifts, however they can also be used to compensate for a weak grip for moderate weight. - Feed the Velcro strap through the metal ring loop, and slip your hand through, like putting on a wrist watch. - The hook should be pointing down or in the Pronated Grip position. Tighten the strap to your comfort level. - Avoid the sensation to squeeze the bar when using a lifting hook. The metal hook is doing most of the work. - The weight of the load you are lifting is transferred from your grip to the hook and the padded wrist wrap support. - Men and women use hooks for Deadlifts and Shrugs, but they're also good for Lat Pull Downs and awesome as an alternative to Pull Up Gloves or Grips! At GymPaws Inc., we design products for performance and power over profit. Our team includes Certified Personal Trainers, Bodybuilding and Weightlifting Pros, Exercise Physiologists and Athletes. Search for @gympaws on any Social Media platform for useful product demos and weightlifting and workout tips. 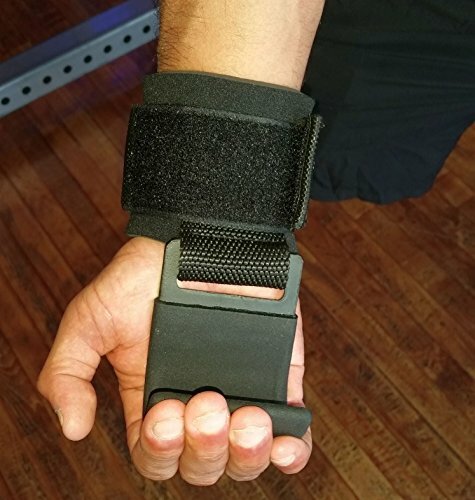 Military Grade 4 mm Neoprene Padded Wrist Wrap for superior comfort. Thicker and more durable than industry standard. Heavy Duty Aluminum Hooks with exclusive ProGrip Non-Slip Rubberized Coating. Great as Deadlift Straps or when used for Shrugs, Lat Pull Downs or Pull Ups! Unisex sizing for Men or Women. Simply adjust the sizing and tightness with the Velcro closure. If you have any questions about this product by GymPaws, contact us by completing and submitting the form below. If you are looking for a specif part number, please include it with your message.